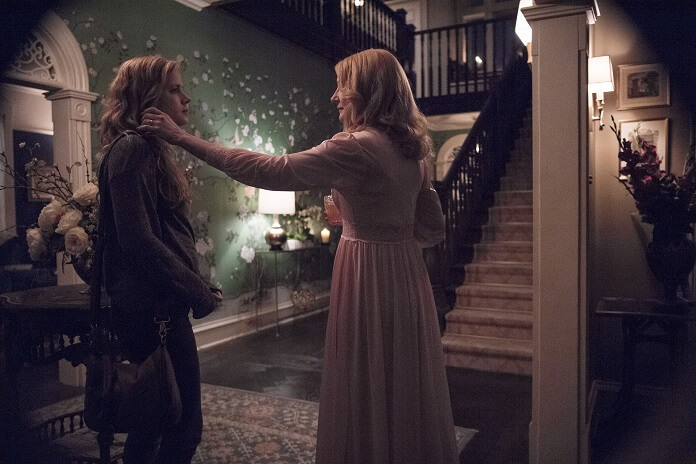 HBO has debuted the first teaser trailer for the limited series, Sharp Objects. The upcoming series is based on Gillian Flynn’s novel and has five-time Oscar nominee Amy Adams in the lead role. Amy Adams earned Best Supporting Actress Oscar nominations for her performances in The Master, The Fighter, Doubt, and Junebug. She also picked up a Best Actress Oscar nomination for starring in David O. Russell’s American Hustle with Christian Bale and Bradley Cooper. Based on HBO’s reputation, the source material, and this one minute teaser, it’s possible Adams could find herself in the running for her first Emmy. The cast of HBO’s Sharp Objects also includes Patricia Clarkson (House of Cards, the Maze Runner films), Chris Messina (The Mindy Project), Eliza Scanlen (Home and Away), Elizabeth Perkins (This Is Us), and Matt Craven (NCIS: Naval Criminal Investigative Service ). Henry Czerny, Taylor John Smith, Sophia Lillis, and Madison Davenport co-star. Author Gillian Flynn co-wrote the scripts with Marti Noxon and is involved as an executive producer with Noxon, Amy Adams, Jason Blum, Charles Layton, Jessica Rhoades, Nathan Ross, Gregg Fienberg and Jean-Marc Vallée. Jean-Marc Vallée directed the limited series. Co-executive producer Vince Calandra, co-producer Scott Brown, consulting producer Alex Metcalf, Ariella Blejer, and Dawn Kamoche also worked as writers on the series. Sharp Objects will premiere in July 2018. The series is an Entertainment One (eOne) and Blumhouse Television production. The Plot: Based on the book of the same name by The New York Times bestselling author Gillian Flynn (Gone Girl, Dark Places), this eight-episode series tells the story of reporter Camille Preaker (Adams) who returns to her small hometown to cover the murders of two preteen girls. Trying to put together a psychological puzzle from her past, she finds herself identifying with the young victims a bit too closely. Previous Article‘Penguins’ Trailer Arrives: Because Who Doesn’t Love Penguins?